Key findings on the trends and benefits of retargeting on the world’s largest social network. Retargeting on Facebook has become an indispensable tool for digital advertisers. 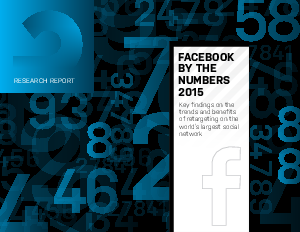 In our Facebook by the Numbers 2015 research report, we analyze AdRoll Retargeting campaign data across our global customer base. The findings in this report summarize our in-depth, yearlong review of over 55,000 campaigns, which served a staggering 37 billion impressions worldwide. How much has the average advertiser spend increased for AdRoll Retargeting on Facebook? What significant performance improvements did AdRoll advertisers see after adding Facebook to an existing display retargeting campaign? What made B2B marketers change their minds about Facebook? How much better does dynamic personalized creative perform, compared with static ad creative? What increased—and decreased—after adding mobile retargeting to an existing Facebook campaign?